First of all, apologies to those of you who receive this via e-mail because you’re subscribed to this blog. Kindly delete this message if this doesn’t interest you. This GE MLS is a lowband radio with 40 watt output. Frequencies are programmed for 3 local (to Syracuse) repeaters: 53.67, 53.05, 53.63 and 52.525 simplex. A desk mic is included. Also included, a mobile mounting bracket (not pictured). $50 $40 The price keeps dropping until it’s gone! Yep, I’ve really let this website slide. Life happens, with timing and intensity that are difficult to predict or control. A *LOT* has happened in the past few years. As time permits, I’ll try to bring you up to speed on all the repeater happenings. When I last posted, the 10m repeater had just come online. Since then, the 6m/10m system has been joined by three repeaters on 2m, two on 70cm, and one on 1.25m. There are some interesting stories about those repeaters and how they came to be, and we’ll get to them soon. These repeaters are located on transmitting towers owned by one of the nation’s largest broadcasting companies. Many broadcasters do not allow amateur repeaters on their towers; thankfully this company takes a very friendly position toward amateur operation, and allows our repeaters on their towers at essentially no cost for tower space, inside equipment space and electricity. Form a new 501(c)(3) to become the owner and operator of the repeaters. This is much harder than it sounds, and would likely take much longer than the company was willing to wait. Enter into an alliance with an existing 501(c)(3), to become the sponsor or “umbrella” organization for the repeaters. Find new locations for the repeaters. This would likely require shutting down one or more of the repeaters, and splitting up the rest to different locations, with moderate to severe degradation in coverage area compared to what we now enjoy. Shut down some or all of the repeaters and call it a day. Nobody wants to see that happen, because repeaters on prime tower sites are always a strong asset to the amateur community. Discussions commenced with the LARC Board, which eventually resulted in the agreement that is being announced in this notice. Q. What exactly is the agreement? Does LARC now own and operate the repeaters? A. There will be no ownership change. The KD2SL, KC2VER and W2QYT repeaters listed above will now operate under the umbrella of LARC, which means that LARC will sponsor our presence on the towers by signing the lease with the towers’ owner, and providing liability insurance coverage. The ownership, maintenance and control of the repeaters does NOT change – it will continue to be handled by KD2SL, KC2VER and W2QYT, who are all LARC members. Q. How can LARC sign the tower lease when they don’t actually own the repeaters? A. We were completely up front with the towers’ owner about this, that the repeaters would be owned and operated by individual LARC members, rather than LARC corporately. The owner indicated that this did not conflict with the lease terms. Q. What will change on the repeaters? Call signs? Nets? A. The biggest benefit to this arrangement is that the repeaters will remain in place, continuing to operate as they have been. The call signs will not change, and the nets will continue on the same schedule. The only difference you’ll hear is occasional announcements thanking LARC for sponsoring our presence on the towers. Q. Who pays for the lease and the insurance? A. We three repeater owners will reimburse LARC for any and all costs that may be incurred as a result of this agreement. Due to the generosity of the towers’ owner, these costs are minimal. Q. What about maintenance costs for the repeaters – radios, feedlines, antennas – that sort of thing? A. The repeater owners will continue to be responsible for all of that. LARC’s role is to sponsor their presence on the tower sites. Q. Do I have to join LARC if I want to use the KD2SL-KC2VER-W2QYT repeaters? A. No. The KD2SL-KC2VER-W2QYT repeaters on the TV towers at Sentinel Heights continue to be open to all well-behaved hams, regardless of club affiliation. If you have any questions, please contact any of the three repeater owners: KD2SL, KC2VER and W2QYT. Please join us in thanking LARC for their sponsorship, which allows our repeaters to continue operating on the TV towers! And thank you to everyone who uses our repeaters. Join us each Wednesday at 7:00 pm for Tim Colson’s (N2VZD) Central New York Swap and Information net, now a tri-band net! A quick note to let you know that I’ve added “experimental” 10 meter RX and TX to the repeater. The RX is VERY deaf, so don’t even bother trying to hit it. However, I would be interested in receiving your reception reports from the 10m repeater TX, which is 29.640 MHz. It should be transmitting anytime 53.670 is transmitting. If anyone knows of a good spot for a 10m receive antenna, that can be linked on UHF to the repeater site at Sentinel Heights, please let me know. 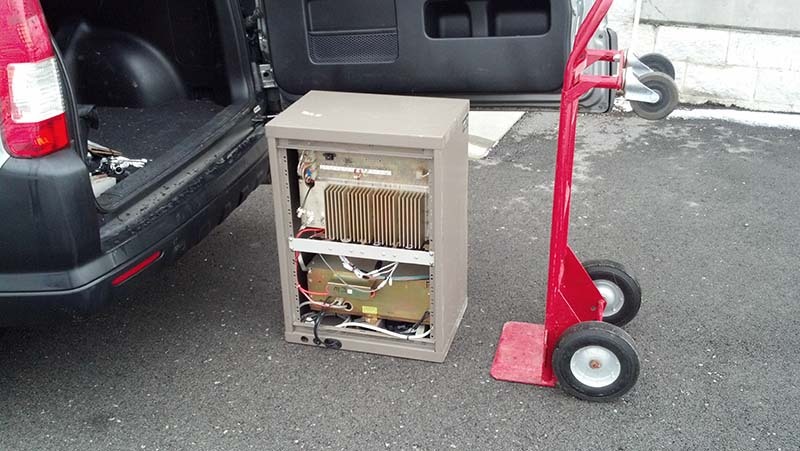 Repeater version 2.0, on its way from the car to the transmitter building. That thing weighs at least 125 lbs – good old ‘merican engineering! New and different? Yes! Better? In some ways. Back in May of this year, when the 53.670 MHz repeater went on the air, I received an e-mail from a very wise person. He said, “Congratulations! But, this is just the beginning. You will NEVER be finished working on the repeater.” So very true. Not long after repeater version 1.0 went on the air, I received a donation of yet another VHF low band Mastr II. My thought was, “I can bring this home, take my time studying and converting it to 6 meters, and have a spare!” Well, as most hams can attest, little projects mushroom into bigger projects, consuming way more time and money than you expected. Now that repeater version 2.0 is on the air, I’ll have a little more spare time to document what happened. Stay tuned for more frequent posts in the coming weeks, and I’ll fill you in on what’s under the hood. UPDATE, December 13, 2012: The antenna configuration is back to “normal,” (and has been since late September, actually) with both TX and RX from the top antenna. I’ve changed the antenna configuration again. I think we got all the data we needed from yesterday’s experiment. To review, on Thursday morning I installed a 1/4 wave ground plane near the base of the tower, about 800 feet below the old channel 3 antenna. I fed the receiver from this new antenna, but left transmit on the top antenna. As expected, this degraded the repeater’s ability to hear, primarily because of the difference in height. Repeater transmit was not affected. Now, as of 1:30pm Friday (Sept. 21), it has been reversed. We’re receiving from the top antenna (horizontal polarity), and transmitting from the bottom (vertical polarity). This will degrade your ability to hear the repeater, especially in fringe areas, but the repeater’s receiver should be working better than ever (no cracklies or desense from intermod). Thanks to EVERYONE, you have all been really great sports, willing to play numerous rounds of “can you hear me now?”! I’m very interested to know how well you can hear the repeater in this current arrangement. As of about 10am today (Thursday Sept. 20), we are now transmitting on the top antenna, but receiving on a new antenna – a vertical (ground plane) mounted at the base of the tower. I am very interested to hear your observations. Your reception of the repeater should be the same, but there will definitely be some differences on the repeater’s receive side. It is now vertical (big improvement), but it is 800 feet lower (big loss). Did we gain more than we lost? Also, the cracklies should be completely gone. Yet one more positive factor is that we probably have less site noise at this antenna location (i.e., we don’t have kilowatts of UHF being crammed down our throat from the TV broadcast antenna). So, it is a big unknown. An experiment. In a few days, we’ll flip flop and receive from the top, transmit from the bottom.